I have had no fodder for blogging lately. I have writers block, or mommy exhaustion or maybe all of these things. Lilly and I are heading to Disneyland on Sunday for four days by ourselves. I am almost 100% positive I will get much fodder while there. In the meantime, sorry for the lack of posting. We've just been lounging around here! 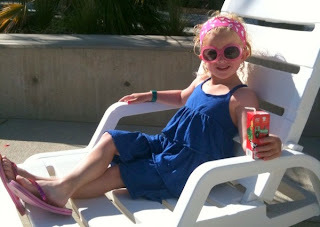 diva in the making, for sure! I understand about no fodder. Some fodder is better than others. In this case a picture is worth a thousand words. This is one of those.